GRAND CANYON WEST, ARIZ. — Perched over the Grand Canyon close to a mile above the Colorado River, a massive, multimillion-dollar glass walkway will soon open for business as the centerpiece of a struggling Indian tribe's plan to lure tourists to its remote reservation. 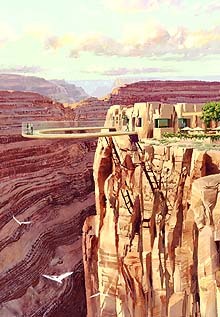 An engineering marvel or a colossal eyesore, depending on who is describing it, the horseshoe-shaped glass walkway will jut out 70 feet beyond the canyon's edge on the Hualapai Indian Reservation just west of Grand Canyon Village. Buttressed by 1 million pounds of steel and supporting 90 tons of tempered glass, the see-through deck will give visitors a breathtaking view of the canyon. When the cantilevered structure opens to the public next month, it will be the most conspicuous commercial edifice in the canyon. And, if the tribe's plans come to fruition, the Skywalk will be the catalyst for a 9,000-acre development, known as Grand Canyon West, that will open up a long-inaccessible 100-mile stretch of countryside along the canyon's South Rim. The cost of the Skywalk alone will exceed $40 million, tribal officials say. "Skywalk is the 'wow' that will draw people," said Steve Beattie, the chief financial officer for Grand Canyon Resort Corp., the tribe's business arm. Construction on an attached 6,000-square-foot visitors center and restaurant is to begin after the walkway opens. The Skywalk will charge an admission fee of $25, Beattie said, adding that some of the financing will come from a private-sector partner. Tribal officials say the development, which may eventually include hotels, restaurants and a golf course, is the best way to address the social ills of a small reservation, where the 2,000 residents struggle with a 50% unemployment rate and widespread alcoholism and poverty. But off the reservation, many people regard the development and especially the Skywalk as tantamount to defacing a national treasure. "It's the equivalent of an upscale carnival ride," said Robert Arnberger, a former superintendent of Grand Canyon National Park who was born near the canyon's South Rim. "Why would they desecrate this place with this?" "I've never been able to resolve the apparent conflict between the tribe's oft-stated claim that there is no better caregiver and steward of the Grand Canyon than the tribe, and their approach to the land — which is based on heavy use and economics," he said. "They say the Grand Canyon is theirs to do with however they please. Under law, it's hard to argue that proposition. But obviously the lure of dollars for the tribal treasury is greater than the obligation to manage the Grand Canyon for its cultural and historic values." Other critics say the Skywalk and related development will only add to the commercialization that has detracted from the experience of nature in the national park. "What the Grand Canyon needs most is a place for quiet contemplation and recreation," said Kieran Suckling, policy director for the Center for Biological Diversity, an Arizona-based environmental group. "The Skywalk is part of a process that is turning the canyon into a tacky commercial playground." Not so, say tribal leaders. "You look at the park side, they have 4.5 million people a year — it's Disneyland in itself," said Sheri YellowHawk, a former member of the Hualapai tribal council and chief executive of the tribe's business entity. "They have too many cars and can't resolve their transportation issues. We're looking at their problems and trying to resolve them up front. We've gone through 2 1/2 years of going back and forth with cultural assessment and biological assessments and community input. We have to find a means to self-sustain ourselves. The money is dwindling." The Hualapai have worked for years to attract more tourists to their 1-million-acre reservation. About 200,000 people visit the reservation each year. The tribe levies a charge for weddings on the canyon rim and other events, including a motorcycle stunt ride in which daredevil Robbie Knievel jumped a side canyon. But after a disappointing foray into casino gambling, the tribe decided three years ago to launch a one-of-a-kind development at the rim of the Grand Canyon. The tribe expects the Skywalk to boost tourism at a more modest development already in place: a smattering of sites 120 miles east of Las Vegas offering experiences that can't be found at the park, including an Old West Main Street and cowboy show, an Indian village, horseback riding, wagon rides and Humvee tours. 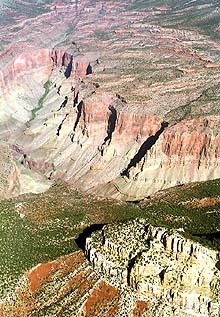 n addition, the Hualapai operate airplane and helicopter tours that fly visitors into the canyon on low-level routes, which are forbidden at the national park. After landing beside the river, visitors can embark on guided pontoon boat and raft rides — day tours not offered in the park. The tribe's master plan calls for the construction of a cable car to ferry visitors from the canyon rim to the river. There, the tribe is also seeking to expand tourism. The Grand Canyon National Park's Colorado River management plan, finalized in December, allows the tribe to take 600 passengers on motorized pontoon boats each day, far fewer than the 1,800 daily allotment the Hualapai requested. Beattie of Grand Canyon Resort Corp. said the boating restrictions would prevent the tribe from expanding river operations, now the tribe's most popular tourist attraction. Although it flows through the reservation, the river is under federal control. Some members of the tribe are uncomfortable with the development. Joe Powskey, a Hualapai guide who takes tourists through a newly built Indian village adjacent to the Skywalk construction site, said that although growth was necessary to give the tribe an economic base, tribal leaders needed to be careful not to overdo it. "Our priority is not to overdevelop," Powskey said. "We want to kind of keep it pristine here." Powskey said he was aggrieved to see visitors step down from buses and toss cigarette butts around the rim. "We ask people not to smoke. They do. We tell them not to throw cigarettes around; the bones of our ancestors are buried here." Others in the tribe have been critical of what they say is the development's lack of sustainability, pointing out that water used here is trucked in over miles of unpaved, rutted roads, and that there is no sewer, trash, telephone or electrical service. The airport, which is expanding, operates on diesel generators. The park, in contrast, has a busy complex of hotels, shops and restaurants, most clustered on the South Rim of the Canyon, several miles upstream from the reservation. The park does not draw water from the river, but from an aging pipeline. Tribal officials admit it will be difficult to operate a full-service resort without upgrading infrastructure and finding a local source of water. Hualapai officials said last week that they were considering taking water from the Colorado River. Pumping water up nearly a vertical mile from the river to the rim of the canyon could be fraught with financial and legal challenges. Joseph Feller, who teaches water law at Arizona State University, says no tribe has ever taken water from the Colorado without first negotiating with the federal government. The tribe's YellowHawk said: "We're looking at pumping water out of the river; that may be our best bet." She added that the tribe was attempting to negotiate with the Department of the Interior. Attorneys with the department solicitor's office confirmed that the tribe had made initial overtures regarding water rights on the Colorado. Feller said there was no doubt the Hualapai had long-standing rights to water from the Colorado, but how much they may take has not been determined. "Usually, you end up with a legal settlement, in which the tribe accepts less water than it wants in return for federal financial assistance to put the rights to use," he said. But once the infrastructure issues are resolved, "there's no end to investors who want to be a part of this," Beattie said. "Who doesn't want to be part of the Grand Canyon?" The above article is from The Los Angeles Times.